You’ve probably not heard of Malcolm Elias. If you saw him walking down the street, he’d probably be indistinguishable from any other 62-year-old. Thinning white hair and carrying bit of weight around the belly, Elias wouldn’t look out of place down the local pub on a Friday night. However, not many other 62 year olds have had as much influence over British football over the past decade as Malcolm Elias. Head of Talent ID for Southampton, Liverpool, and now Fulham, Elias is the man responsible for bringing the likes of Gareth Bale, Luke Shaw and Theo Walcott into professional football. Elias’ work takes him to all sorts of games: in Bale’s case, it was a six a side tournament for under 10s in Cardiff. In the case of Patrick Roberts, it was a Surrey schools side select. With Theo Walcott, it was Swindon Town under 13s. However, even five years ago, it had become imperative for Premiership clubs to look beyond these shores in search of new talent. That’s how Malcolm Elias ended up in Val de Marnes, just outside Paris, watching France under 16s take on the United States in a youth tournament. There was no shortage of talent for Les Bleuets that day. Presnel Kimpembe would go on to play professionally for Paris Saint Germain, and was part of the side that took apart Barcelona 4-0 in the Parc des Princes last month. Fifteen months after the tournament, Kingsley Coman would make his debut for the full PSG side at the age of 16, and today has winner’s medals from Ligue 1, the Bundesliga and Serie A at the tender age of 20. However, Elias was not there for either of these players that drizzly Saturday in the Parisian suburbs. He was there for a gangly winger called Moussa Dembélé. Five years later, Dembélé’s life has changed considerably. For starters, he’s now a striker. Not a bad one either. After leaving Fulham in the summer of 2016 for Scottish champions Celtic, the Frenchman has scored 29 goals in 2,899 minutes of play: just under a goal every ninety minutes. He’s shown a flair for the big occasion too, netting five goals in three games against Rangers, as well as scoring a brace against Guardiola’s Manchester City side whilst on Champions League duty. This has resulted in a feeding frenzy for European clubs. Real Madrid, Bayern Munich, Chelsea and Arsenal are all credited with an interest in the 20-year-old, amidst speculation that the bidding could reach £35m- nearly three times the record for a Scottish based player. So how does Moussa Dembélé score goals? And just how far can he go? 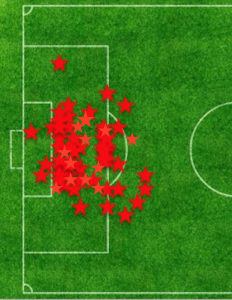 The overwhelming majority of his 71 shots have come from the central channel of the box. As a striker, this is logically the best place to shoot on goal because this is where the goal is the biggest. Shots from wide or shots from distance are both usually either blocked or saved simply because keepers either have more time to react, or can narrow the angle on the striker and shut off most the goal. Moussa Dembélé therefore does neither of these things. He shoots close to the goal, and he shoots centrally. As a result, he scores goals. This is all very well and good. However, if you asked most strikers in professional football where they would like to take their shots from, they would most likely want to shoot from this area too. The reason they don’t is that this is precisely where defenders want to be: the central channel of the box is quite simply the crown jewel of the football pitch. The devil is therefore in finding the time and the space in a crowded penalty box to be able to take these shots. This is where Brendan Rodgers comes in. Not a bad testimony from Luis Suarez. Prior to the Ulsterman’s arrival at Anfield, Suarez had had a stellar, if unspectacular first full season in English football. While he had plenty of playing time, the Uruguayan had looked perhaps isolated, and failed to find a consistency in his goalscoring. This would all change when Rodgers took the reins. In his first eighteen months at Liverpool, Suarez scored 15 goals in 44 games. After Rodgers came in, that went to 54 goals in 66, as Liverpool came within two games of a first Premier League title in over twenty years. Barcelona soon came calling, and the Uruguayan has proven himself as one of the top strikers in the modern era. Similarly, before his goal a game season in Scotland, Moussa Dembélé had hit 15 in 56 for Fulham. Not bad for a teenager, but Brendan Rodgers has effectively quadrupled his scoring rate in less than a year. There is only so far you can go in comparing Suarez with Dembélé, but Rodgers has realised the potential in both as lone striker wrecking balls. While the pair may hog the headlines for their goalscoring, both have a supporting cast to thank for the upturn. Rodgers tends to play with five out and out attacking players: one striker, two “inverted wingers” who get narrower the further they are up the pitch, and two central attacker from midfield. At Liverpool, throwing such a quantity of players forward tended to result in a tendency to lose goals through the counter. However, Celtic have lost just one Premiership goal to a counter attack this year- in their 5-1 defeat of Rangers in September. This is mostly down to the discipline kept by Scott Brown, who has dropped slightly deeper this season and uses his excellent reading of the game to snuff out counter attacks through means fair or foul. Such a sacrifice means fullbacks Tierney and Lustig can push high and wide, knowing that Brown can provide cover. Width and depth make defending this a geometrical nightmare for Scottish teams. These six players between Dembélé and Brown move up, down and across the field to pull, twist and push the opposition defence all over the place. Moussa Dembélé is quick, strong and a good finisher. However, as with all elite footballers, it is his speed of thought which has brought him his success. Dembélé knows exactly where to be and exactly when to be there. Granted, he is blessed with an energetic, talented supporting cast, as well as a bold tactician in Brendan Rodgers. However, it would be churlish to suggest that he is merely a product of this environment. Rather, in possessing excellent awareness and anticipation, he is able to translate the flow of activity buzzing around him into football’s most important currency: goals. He may make it look simple. It’s anything but.